The aircraft is painted in RLM 74/75/76 and carries the white band ( Reichsverteidigungsband ) with the black curved bar for group identification, typical for Jagdgeschwader 3. The exhaust gas eagle is RLM 22 black, outlined in red. The propeller is RLM 70 blackgreen. The spinner is black with a yellow coil. The wing leading edge is painted in a wavy pattern. was born on Jan 29, 1920 in Wuppertal-Barnen. Non commissioned officer Maximowitz volunteered for Sturmstaffel 1 towards the end of 1943. On Jan 30, 1944 he shot down his first four engined bomber, a B-24. On Mar 23, 1944 a third bomber ( B-17 ) fell victim to his MG's. 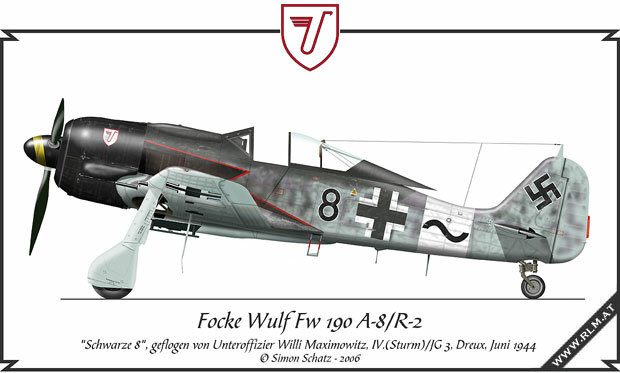 His Fw 190 A-6, W.Nr. 551 099, "White 10" was hit and the injured Maximowitz had to perform an emergency landing near Wuppertal. By end of April he was back in service and on Apr 29, 1944 he shot down another B-17. On May 8, 1944 the Sturmstaffel 1 has been integrated to IV./JG 3, as 11. Staffel. During June 1944 the IV. Group acted as ground support in Normandy. Those operations were based at the airport of Dreux in France. As from July orders changed and operations against US bombers were again on the list. On Jul 30, 1944 Willi Maximowitz was promoted to staff sergeant. He was again wounded during a crash while landing in his Fw 190 A-8/R-2, W.Nr. 680 756. After his recovery he served as Katschmarek for group commander, Captain Wilhelm Moritz. IV./JG 3 was relocated to the Eastern front in February 1945, where Willi Maximowitz could score another 12 victories. On Apr 20, 1945 warrant officer Maximowitz did not return from combat mission. Most probably he has been shut down near Frankfurt/Oder from Russian fighters. Willi Maximowitz shot down 27 enemy aircraft, including 15 four engined bombers. For his efforts in air combat, he was awarded with the German Cross in Gold. 1978 I was born in Vienna and I am working as technical employee in an architect's office. I am building plastic models since I am 12. It started with a F-16 Fighting Falcon in 1/32, which was followed by a few cars and trucks. A Heinkel He111 H-6 in 1/72 brood my interest for the German Luftwaffe. Since 2001 I am creating color profiles also. Some of them have been already published in relevant magazines and books. The motto for building models and drawing profiles is the same: Learning by Doing. To practise my passion it is required to collect the necessary documentation, an expensive, but interesting hobby, especially when I can obtain rare second hand aviation antiquars.